After ordering my new Gear Box t-shirt (courtesy of Crowkillers) at BrickShirts.com, I come into conversation with Bob Kojima to realize we was the author of an old model build back in 2004 - A Rolling Ball Clock, based on the Arrow Handicraft Deluxe Rolling Ball Clock [1, 2] that was popular in the 80's. "To tell the time read the hour from the 3rd row of balls. For the minutes add the 1st and 2nd row of balls together. On the first row 1 ball = 1 minute. On the second row 1 ball = 5 minutes. My friend Chris Scheuerman asked me if I had ever seen a rolling ball clock before. He told me that he just got one and that I should come take a look at it and try to make one out of LEGO. I never did go over and look at his clock. In fact my clock was built strictly from pictures found on the web. I have never seen one of these clocks in person. I spent about 2 months making this MOC and 1 month fine tuning and debugging. The ball holding, balancing, tilting, and logic was simple to make. It did take a few Bricklink orders to get enough ribbed tubbing and soccer balls. The lift mechanism is what stumped me. I thought about it for about a month before I came up with a design that I thought would work. It still took a lot of tweaking to get it to work correctly. The real clock has a rotating arm that lifts the balls up to the top. I was originally going to copy the same rotating arm, but I would have needed a very long arm because of the height of the ball logic. So I went with the chain lift mechanism. It turned out very well. During debugging improvements were made like adding extra guard rails so all the balls would return to the ball holder and not the ground. One problem that I have not solved yet is the lift mechanism is not 100% accurate. Very rarely, 2 balls are lifted at the same time or no balls are lifted at all. 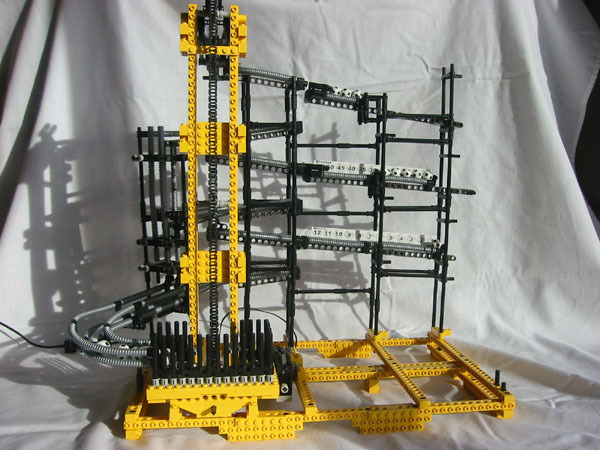 But i think that the no lifts and the 2 ball lifts even then selves out because after running for 3 days at Brickfest PDX it was only about 1 or 2 minutes off." You may find several photos from Bob's clock and LDraw building instructions at his BS folder. When I first saw this old school LEGO clock it was "unfortunately" not the original design by Bob Kojima, but the adaptation of this model done by Philippe Hurbain. Philo's main modification was the addition of a RCX to obtain good long time stability, resulting into less than 1 minute drift over 24 hours. 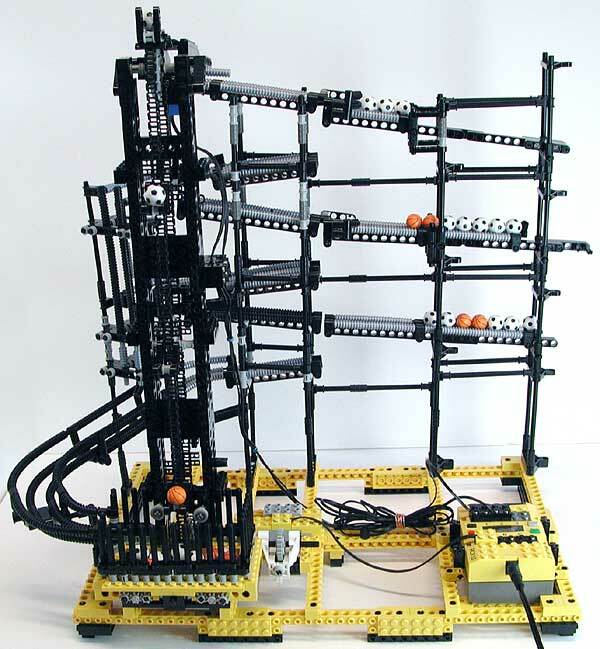 "The problem should have been very simple: each minute, start the elevator until a ball is detected by one sensor. Unfortunately, my first try over a several hours period showed me that my clock was fast, several seconds each hour! After eliminating all mechanical possibilities (two balls at a time, or an undetected ball), I concluded that my RCX itself was fast... To make sure, I finally put a frequency meter probe on RCX crystal, and indeed it oscillates at 16.03 MHz instead of 16.00 MHz. So I finally added some code to wait for 6.92 seconds each hour." Hence the problem was solved with some additional NQC programming code. Well... it was done as you can see from the comments page to this post. See the module that got inspiration from those above, here and here (This is the best footage of the module that I've seen, but it may take a long wait to start streaming. Jump at about one third of the film where it all starts). Don't know who was the author, though. Maico Arts, member of De Bouwsteen and BeLUG was the author of this module. I'll edit the post to make a mention to this. Here is a version I made 2 years ago, using no bendy pipes, and using marbles instead of lego balls. There are several GBC implementation of similar systems. Here in the States, one of the first large-scale "ball counters" in a GBC was built by Rafe Donahue, and consisted of a large series of binary switches (counting easily up into the thousands... OK, 'thousand & twenty fours :) '). I currently have a ball counted that uses three different types of counters cascaded together in order to count by 100's and 1000's... but I have to admit the original lift for the very first GBC module ever made was directly inspired by Bob's original lift system.